Anyone who really knows me, knows that I am a long-time PC Gamer. Somewhere on the top ten list of my most favorite games would have to include Diablo 2. Old hometown friends of mine and I spent hundreds of hours at LAN parties in the late '90s and in early 2000s playing this game for week-long periods together, hold-up in the basement of one of our respective parents' houses on spring break or over Christmas break when home from college. We would play this game from Act I through Act V, starting off with new characters, and by the end of the week, would have beaten it on Normal, then Nightmare and finally Hell. This was the perfect co-op multiplayer game that would support up to 8 people at once. I tell you all of this to give you an appreciation for just how long I have been waiting for Diablo 3 to come out. Blizzard had gotten side-tracked in making the successor to Diablo 2 due to their almost decade-long cash cow escapade that is known as World of Warcraft. Due to WoW's success and its heavily evolved style of gameplay since it's release in 2004, I was afraid a lot of developers and designers who had worked on WoW would be the same ones working on Diablo 3. When World of Warcraft first came out, I played it and enjoyed it but eventually grew tired of the direction that Blizzard had taken the game when most players had hit the level cap and Blizzard put mor emphasis on end-game repeatable raids and not new quests/storyline content. Given that Diablo 2 came out in the summer of 2000, and that many of the Diablo 2 core team have probably moved on to other projects or even left Blizzard, I was afraid Diablo 3 would be taken in a direction that I wouldn't enjoy as well. Now, I am writing this first piece on the game having only played Act I and Act II so far, as the game came out this past Tuesday and my wife and I left Thursday morning on a long road trip to Indiana to visit her family, attend her little sister's graduation party and to attend a wedding. Because of my limited playtime, this can in no way be considered a comprehensive review. Given that so many other people will be writing comprehensive reviews (and will be doing a much better job at it than I could do) I plan for this series of posts to be smaller brain dumps that I will write as I progress through the game. I'm writing Part I having completed 1/2 of the game on Normal difficulty. As any Diablo fan knows, you start off by beating the game on Normal, and then you start over bumping the difficulty up to Nightmare. You do the same for Hell, and now with D3, there is the new Inferno mode. Despite the fact that you "finish" the game by the end of Normal, you keep using the same character to play Nightmare, Hell, and Inferno - keeping the same gear/skills/spells/money etc. As you play it gets harder and harder, the items change, and you continue to level up. Playing D3 through on Normal is a lot different than playing it through on Inferno. Thus the appeal of the Diablo series. Gamers get a lot of playtime out of the game, and at least with D2, Blizzard does an excellent job of writing a compelling story that makes the game interesting to play, no matter how many times you play it. Another benefit is that the areas of the game are dynamically generated, so no two play-throughs will be the same. Other than the quests not changing in content, the game feels different each time through. I was familiar with some of Act I's content already when I began playing due to the fact that I was one of the lucky few that Blizzard invited into the closed beta. In the closed beta, Blizzard gave the beta testers a brief taste of the game by letting them complete the first quest or two (I forget how many) but suffice to say it was very short. I remember it taking me about 30 minutes to play through the beta content and my character capped out at level 8-10 after having done so. Because of this, the first little bit of the game was repetitive but it did not take long for me to move past that into new territory. I started off by playing a Barbarian, the same class of character that I thoroughly enjoyed when I played Diablo 2. The D3 dev team has done a wonderful job at making the Barbarian class in D3 feel very powerful. When your character hacks and slashes monsters, the blows feel like they pack a lot of umph. The graphic effects of the hits are well done, and depending on the type of hit, bodies fly across the screen at veloicity in a very satifying way. After having now completed Act I and II, I can say that they feel a lot like Act I and II of Diablo 2. The visual style of Act I is temperate outdoors and ends in an underground gothic/medieval style setting. Act II takes place in a desert setting, also just like D2. Additionally, some of the most annoying mobs encountered (hard to hit + poisoned based) appear in Act II, just as in D2's Act II. While the decision to keep Act I and II so similar to the previous game, I'm glad they did so. They were fun before. They are fun now. The bosses in both Act I and Act II were fun to fight. The Act I boss was very satisying to defeat because her stoyline arc was annoying - it was a pleasure to take her out. The Act II boss was a bit surprising because as you take him down to 1/4 health remaining, he morphs into a much larger form and regains 100% health. His reformed version is much harder to defeat, but fun once you figure out exactly which combination of skills/spells works for him. Blizzard has changed the way skills work, however, I'm not sure the new system is better or worse, just different. It feels like I have a lot less options, but I suspect that is due to the new skill rune system. You may set a skill/spell to your left and right mouse button, and to keyboard buttons 1, 2, 3, and 4. Each skill/spell has a set of different runes you can unlock at various levels. These runes grant different bonuses that add on to the base skill/spell effect, but you may only select one rune at a time. Because there are so many options, and you can only select so many at once, you feel limited. To be fair, when thinking about what my options were in Diablo 2, I think I have more options in Diablo 3. It just "feels" limiting, and I'm not really sure why yet. Once I complete the game I want to revisit this topic. Another change that Blizzard made was potions (mainly health). Mana potions have been eliminated altogether. Each character's "mana" pool is called something different depending on the class, and either generates automatically or you consume it and it has to recharge. I welcome this change. As for health, in D2, you could fill your inventory with health potions and chug them like budweiser at a frat party during boss fights to stay alive. In D3, there is a lot less emphasis on potions, as when you use one you must wait for a timer to tick down before you're able to drink another. You are forced to find other ways to stay healed. As a barbarian, I'm relying on a lot of skills that grant me health back as I do damage. This works okay as long as I have monsters to his (I'm melee, remember) and sometimes gets me in trouble when fighting ranged monsters that I cannot reach. According to the forums (and I try to not read the forums that much as they're too much like unintelligent blog comments), other classes either have an easier or harder time of this. The consensus is the Monks heals easily, while the Barbarian has a harder time of it. As these complaints seem to be said by much higher level players on Hell and Inferno level difficulty games, I'll withold judgement on this until I've gotten to Nightmare or Hell difficulty myself. Overall, I'm very pleased with the game so far. We leave Indiana tomorrow morning and should be home by tomorrow night. I'll be able to start Act III then, and once I complete the game all the way through on Normal I hope write Part II of this series. At long last, Blizzard game fans will be able to get their hands on the latest installment of the Diablo series. The company has announced a launch date for Diablo III: May 15th. The game is coming simultaneously to OS X and Windows. The game launches simultaneously in the US and other countries, and is also available for pre-order through the Battle.net Web site; users can buy the game, pre-load it and start playing it as soon as it’s released on May 15th. Have been waiting for this to come out for about 8 years now. Can't wait. @siracusa When you find yourself getting into an argument with @cwgabriel and telling him he ain’t nothing, might be time to switch fields. @siracusa So *that's* where the line is drawn. Got it! My jaw dropped after I saw this video. via John Siracusa & J.C. Hutchins. I periodically skim my Gmail spam folder for false positives. Once every 90 days or so, Google decides to start flagging the wrong type of automated message as spam (Twitter follower emails was the latest one). While doing this, I noticed the following type of email had started showing up recently. 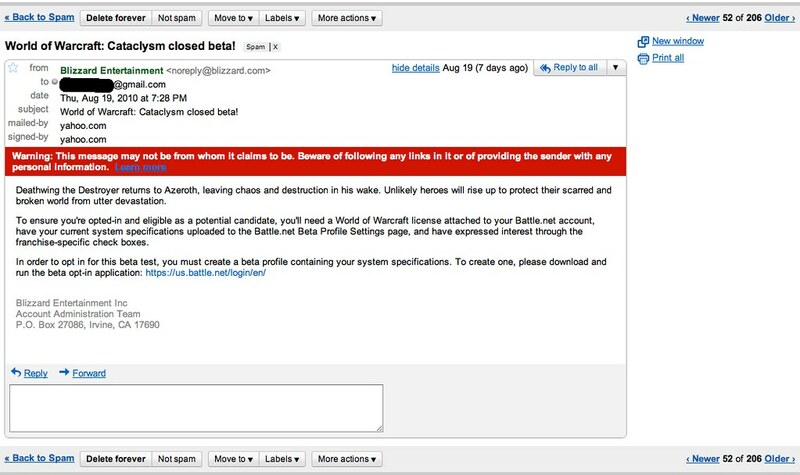 It appears spammers are now preying on the desire of WoW players who want to get an invite to the new World of Warcraft closed beta. Looking through my box there were 5 or 6 of them from just the past 24 hours, from multiple sources, each of them different. This particular one looked the most legitimate, despite that Google flagged it as malicious and its origin came from a Yahoo spoofed account. Nice try.